*Thanks to E for help with this great title! 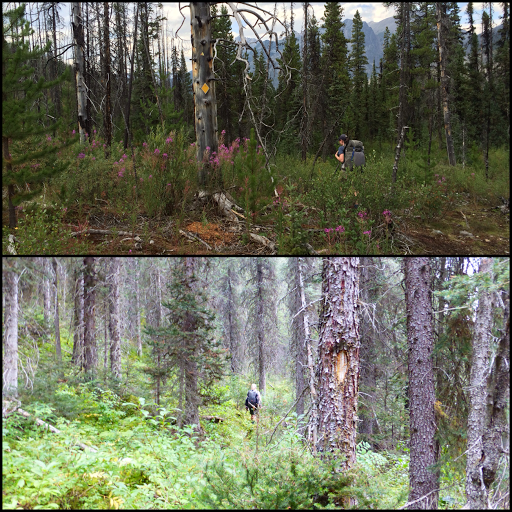 Today was split into three very different types of terrain and hiking. The morning was pretty great. 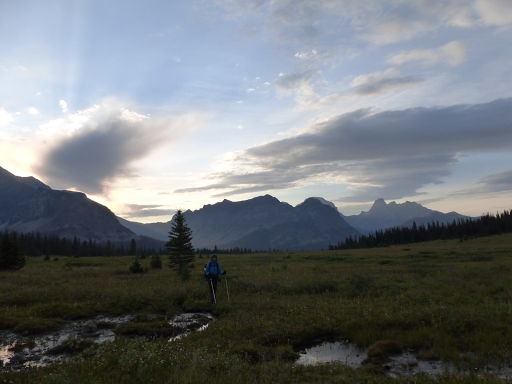 We got going at 6:40am and soon headed out of the boggy stuff and up to some marshy alpine meadows. Just past our campsite, we passed the side trail to where Gian and Laura said they were aiming to camp, so we figured we’d see them later since they tend to leave later and take fewer breaks. 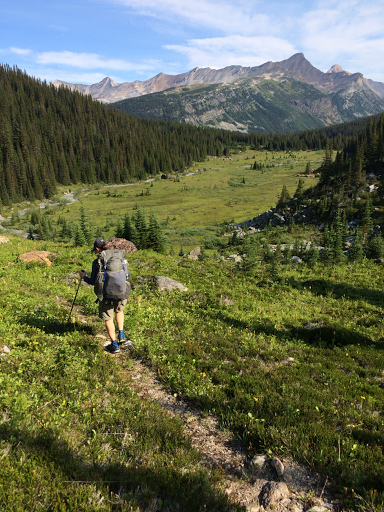 Once we got up to the alpine meadows, we were pleasantly surprised at how great it was up there going over Miette/Centre Pass. It was still pretty wet in the grass and there wasn’t a trail, but it was freeing to go cross country across it aiming for our goal far in the distance. We think it’s the widest pass on the GDT. We both enjoyed it quite a bit and it was the highlight of the day along with the next two passes. Here is the cross country with the sun lighting up Mt McNaughtan and then rhe view looking back as the sun tries to break through low lying morning clouds. 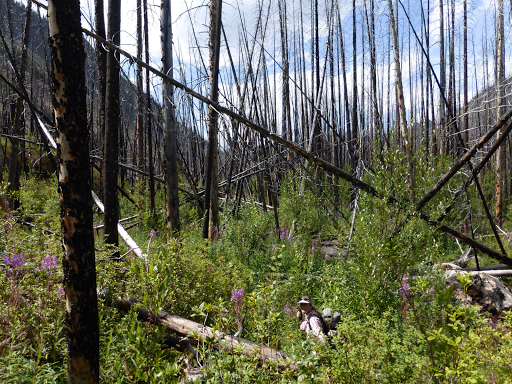 After going over Miette/Centre Pass, we had little confirmations here or there with blazes cut into the trees at times. It was a very subtle way of letting us know we were headed the right direction and we had fun through this whole stretch. Like our own personal scavenger hunt. I’m printing at a blaze and there is a another one on the tree in the foreground. 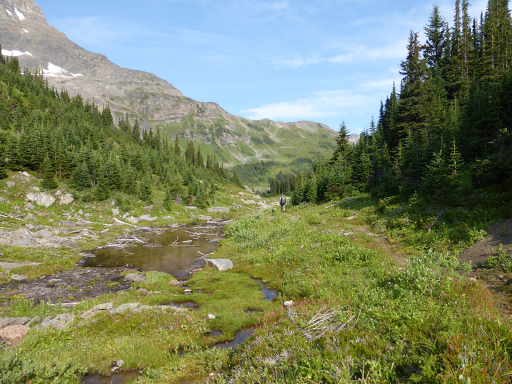 The next two passes of Grant and Colonel Pass were great surprises too! 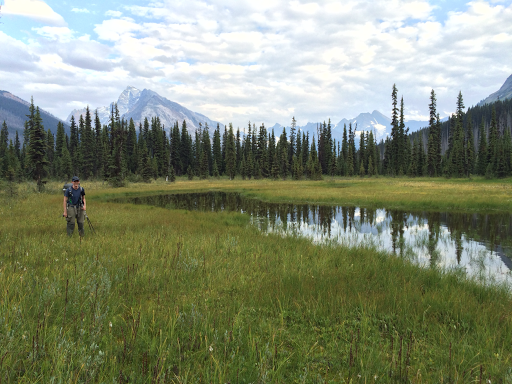 We were not expecting any of these great alpine meadow sights and loved it. Then we had an extended lunch drying out almost everything we owned that got wet overnight with condensation. We took it in and knew that we had a rough afternoon ahead. 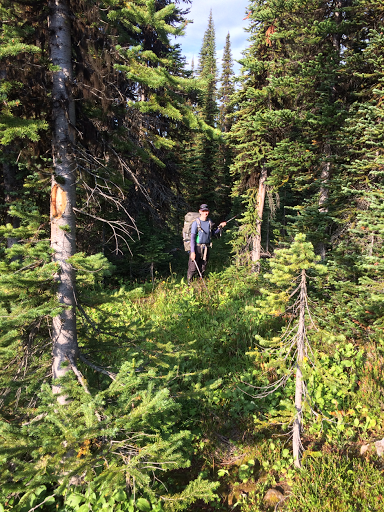 It was a burn area that went along Colonel Creek down to the Moose River. This section is the first one all trail where it took much longer to do than we anticipated. It was like a bunch of Pick-Up Stix had been dumped out and actually looked pretty cool. However, it wasn’t too cool to hike through for an extended period of time. There were some cut logs from a horse crew that came through years ago, but there has been a lot of dead fall since then and the brush is really growing in. 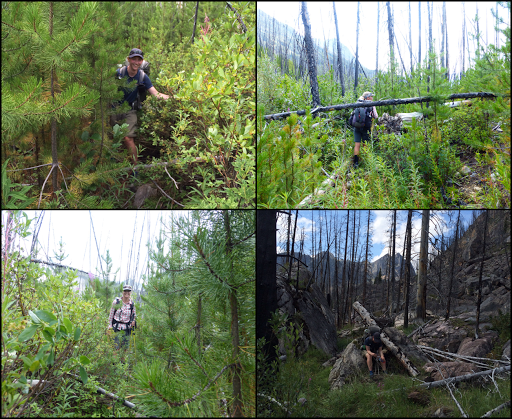 There was a faint trail to follow under all the debris and brush, but it was slow going. 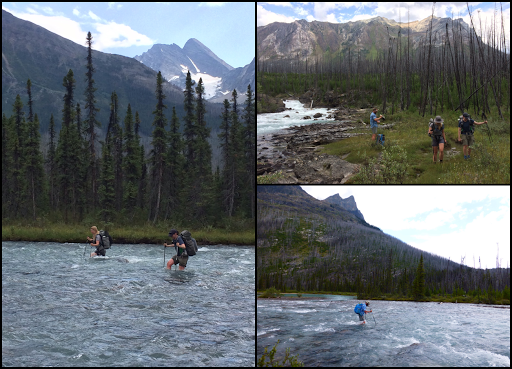 Once we got to the bottom, we hit the third and final part of our day…the Moose River. This is a notoriously difficult ford and it was after 4pm when we got there. It was quite intimidating when we first approached it, but when we looked downstream, it was much wider and shallower. We sat down for a snack break before crossing and that’s when Gian and Laura arrived. We all forded at the same time. I was not a fan, but was glad we wouldn’t have to wait for the morning to ford it when it’s lower. The riverbed was large slippery rocks and the river itself was quite swift. The highest it got on me was mid thigh. After the ford, we hiked about 30mins together before Gian and Laura stopped at their planned campsite for the night. 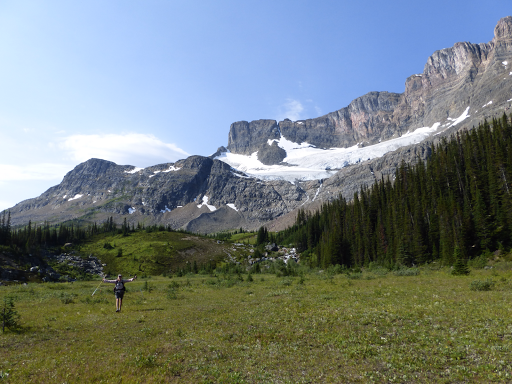 They will finish the trail in two more days at Mt Robson, where many GDTers finish. 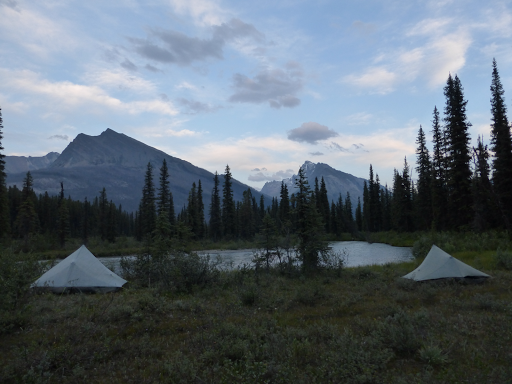 We are resuppling there to do the more remote 9 day finish to Kakwa Lake, so we will all see each other again in a couple days at Mt Robson. The clear trail just abruptly stopped. 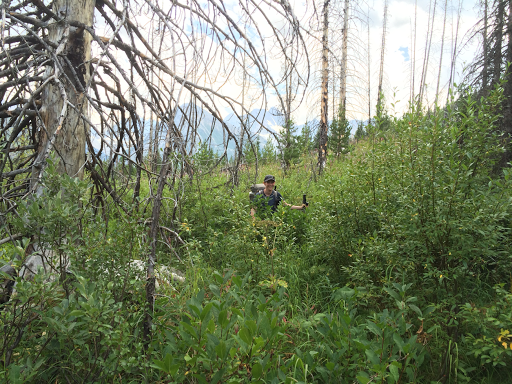 We spent the next two hours bushwhacking through old burn and brush with hardly any trail at all. From time to time, we would see orange diamond blazes on trees or notched blazes in the trees. Each time, it would give us hope and then the trail would either disappear shorty after or not exist at all. Sometimes we’d get a few minute stretch on something without losing it, but there was hardly anything to follow. To add to the fun, the mosquitoes were out in force. 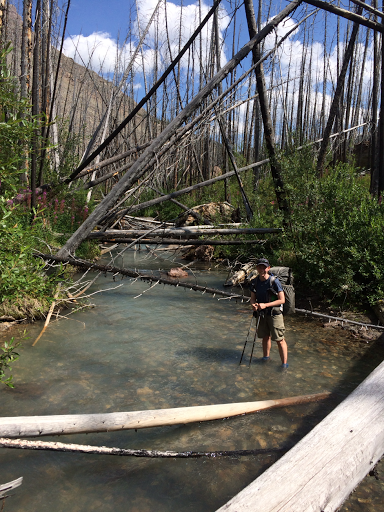 Still, nothing comparable to the what I’ve experienced on the Pacific Crest Trail. I ended up putting pant legs on for the brush (and mosquitoes) and for the second time this trip, I used my bug repellant. The brush and marshy ground combo at the end of a tiring day made for s tough end to the day. 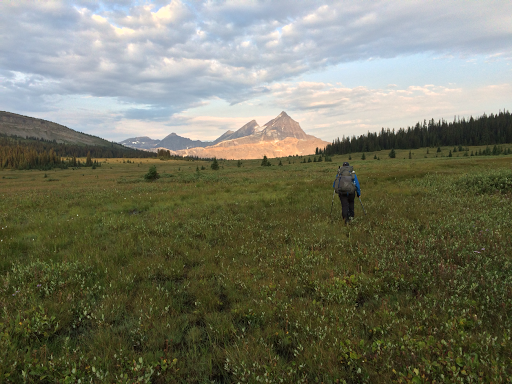 I was spent, but there was nowhere to put a tent down in the soggy meadows with tall grass. we were swimming in brush. Once we hit the river, we saw an abundance of camping opportunities and finally stopped at 7:20pm to set up right on the shore. 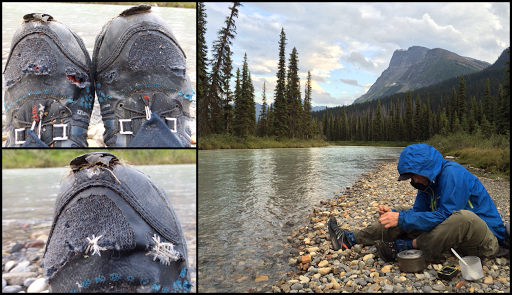 We had dinner along the Moose and I had some shoe repairs to do. If you remember, I got these Salomon XR Crossmax shoes one week into this hike when my Montrail Masochists sole completely went out on Day 7. These Salomons have been amazing and feel great. They have 500mi on them in the last month with a lot of brush and they are coming apart. I had new shoes in Jasper and didn’t want to ruin them with just two weeks left, so I put the new ones in my bounce and decided to risk these. The soles are great and my feet don’t hurt, but they are tearing apart up top. I just need 11 more days out of them and hope I didn’t make the wrong choice on this one. Tonight, I had to sew one of the shoes with dental floss! Seriously, it’s what works and I hope it holds out til the end. Since we stopped so late, we decided to sleep in 30mins later than usual tomorrow. I’m really drained and went straight to sleep without blogging. I’ll do it tomorrow. Way too tired to do it tonight.